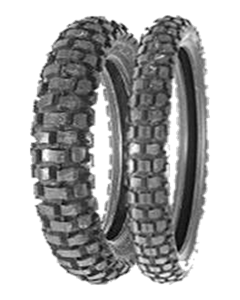 Trail Wing TW301 and TW302 are on-off type tires with primal emphasis on on-road performance, making the tires ideal for the customers who ride off-road motorcycles mainly in metropolitan (city) area.. Considerable attention has been paid to the balance of pattern, shape and compound to reduce differences in performance in wet conditions on ordinary roads, even on manholes covers and painted street surfaces. We have also upgraded the effective pattern design, improved the appearance of wear due to gutters, and reduced steering wobble when riding at speed.TW301/TW302 keep the off-road appearance but in fact provide excellent on-road performance. The center blocks provide stability in straightway, anti-irregular wear. The edge blocks are carefully designed for fine cornering grip in on and off-road uses. DTC technology in rear tire contributes to the long mileage and fine cornering grip. TW302 is the only Trail Wing pattern with DTC technology, making the TW301/302 combination one of the premium lines of Bridgestone trail wing.